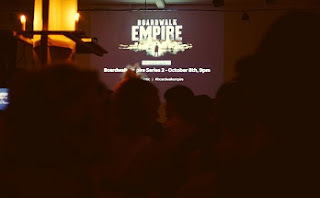 This Saturday sees the return of HBO’s 'Boardwalk Empire' on Sky Atlantic and I was one of the lucky few invited along to a preview screening of the brand new episode. The screening took place during a prohibition speakeasy inspired night at The Candlelight Club in London, with plenty of cocktails, most people dressed up in '20s garb, a free roulette table, as well as jazz and burlesque performances throughout the night. All of these couldn’t help but set the mood for an exciting return to 1920s Atlantic City. The first episode of 'Boardwalk Empire' was set on the day before prohibition, and through the first season we saw how the policy changed the political, social and business side of the resort city. The show follows many real life gangsters including Al Capone, Arnold Rothstein, Lucky Luciano and Bugsy Siegel, even the main protagonist Nucky Thompson is based on a real politician and racketeer with a similar name. That decision may lead to some inadvertent research of the gangsters which could easily spoil parts of the series, the basis in an incredibly exciting time in terms of crime in the States allows the show to constantly be engaging and twist the plot shockingly from time to time. As well as the exciting drama of the gangsters the show also develops personal relationships in the private lives if gangsters and politicians, creating audience attachment to these sometimes despicable characters. The series was created by Terence Winter who made a name for himself by working his way up through the production staff of 'The Sopranos', executive producing the last three seasons. 'Boardwalk Empire' boasts an excellent cast headed up by Steve Buscemi and Michael Pitt, the pilot episode was directed by Martin Scorsese, since then the quality of directing and production has continued to be excellent. As well as having a spectacular cast and crew the show also stands out aesthetically, it’s beautifully shot and makes full use of the period clothing and sets in their its varieties, and the soundtrack is equally impressive. The new season carries on in much the same manner. Though a lot has happened to the characters since we first met them, '21' does well to reintroduce them all and my guest, who had never seen an episode before, enjoyed it nearly as much as I did, finding it easy to follow and worked out the characters relationships relatively quickly. One advantage of watching the new episode in a room full of people was that, for the first time, I was able to realise just how funny some of the scenes are, their subtle humour contrasting well with the drama that surrounds them. So whether you’re already a fan or looking for something new to watch, 'Boardwalk Empire' season two looks set to be as exciting and critically acclaimed as the first. 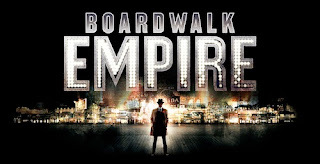 'Boardwalk Empire' Season Two begins in the UK this Saturday (8th) at 9pm on Sky Atlantic.